does implement U/P auth. V5 without U/P is pretty much useless. Actual Results:  No FTP and other protocols except HTTP (that is open). user/pass authentication in SOCKS 5.
auth to work w/ SOCKS, as far as I can tell. Let's rest this bug in peace until someone can give a clear way to see the problem. couple other SOCKS v5 + auth clients. correctly, even though SOCKS V5 + auth is supported in the config dialog. first time, a "No Data" message). NEW, nsbeta1. End users need error messages. Confirm again. Freshly downloaded Mozilla still exhibits problem. Workaround for Linux and Win32. Both these solutions work very well. based SOCKS5 wrapper that allows for SOCKS5 username/password authentication. switch socks servers, see bug 233811. > Workaround for Linux and Win32. Both these solutions work very well. > based SOCKS5 wrapper that allows for SOCKS5 username/password authentication. unencrypted in config is a bad idea. If anyone can help me out with UI and/or PSM, that'd be great. implementation for nsIAuthPrompt. perhaps we should generalize this interface. especially as it also allows other nsIAuthPrompt impls than windowwatcher's. Why is it taking so long to fix this simple problem? authentication. I'm just doing final builds today, I'll post it tomorrow. > authentication is handled seperately. will need a way to set/get an interface requestor. I wonder if this bug has been solved in the version 1.5 beta ? > does implement U/P auth. V5 without U/P is pretty much useless. > Actual Results:  No FTP and other protocols except HTTP (that is open). > I wonder if this bug has been solved in the version 1.5 beta ? No, because if it was, then this bug would be marked FIXED. This bug was opened over 6 years ago, yet I see no attempt to resolve it. Please read the details in bug 457685 which offers justification on why the USERNAME/PASSWORD authentication SHOULD be added. It also mentions the need for error messages. I also noticed that the suggested workaround is no longer reliable because there is no official site for Sockscap or a decent alternative. I read in the threads problems surrounding the ability for necko to prompt a window. First of all, I am sure there is a way it can be done, especially after 6 years. Other than that, why not store the login details in the config, sure it'd have to be plain text, but it's better than nothing. Sometimes security should be left up to the user. SocksCap has stopped being actively maintained as far as I can tell. FreeCap (http://www.freecap.ru/eng) is another alternative for Windows users. There's several others out there but this one is the only free solution I know of. This patch adds support for u/p authentication, im not sure how the username/password should be obtained though... so right now it doesn't actually work. +    // where do i get the username/password from :( ??????? Something better can be done later. This patch adds username/password authentication support to the ConnectSOCKS5. The username/password are stored as preferences. In the event that either the username or password are not set the ability to do username/password authentication is not sent to the server. OK, you really can't store the password in plaintext in a preference, I'm sorry. The right way to do this is to get access to the notificationCallbacks and get an nsIAuthPrompt from there. Ideally, you'd add a new interface just for setting notification callbacks, and use that to set the notification callbacks for all socket types. Then the SOCKS code can get an nsIAuthPrompt that way. - "result" is generally called "rv"
The other option is to get an nsIAuthPrompt via NS_DEFAULTAUTHPROMPT_CONTRACTID, but that is a less ideal solution. You really CAN store the password in plaintext in a preference and I don't see why not. Nobody is forcing you to use it, you use it at your own digression. It'll get sent in plain text anyway, and besides there is usually more layers of security at the other end, including IP restrictions. Further more, if they want more security they can use the GSSAPI method. Further more again, at least this method would stop you fumbling around an issue that has been here for over 6 years. More advanced password handling could come at a later date. any news up on this? 10 years anniversary and still "NEW" -- congratulations! How can it possibly be difficult to implement RFC1929? About RFC1929 being plaintext authentication, some web proxys that require authentication use the "Basic" scheme, which sends passwords in the clear as well. Simple authentication schemes are there to prevent abuse, not to protect accounts. This bug is accepting contributions, so if you believe the change is straightforward feel free to make a proposal. I coded this up a long time ago, and found the difficulty was not implementing RFC1929 but hooking in an acceptable UX. SOCKS is supposedly "transparent" to the higher level socket operations. Spinning up UI to prompt for username/password is anything but. The difficulty here will be restructuring code to make SOCKS less "transparent" to the higher layers. I was just venting my frustration, please forgive my arrogance... I did not mean to insult anyone. So, the problem is that the connection part of the code is unable to obtain credentials from the config? Configured u/p would be enough for most people. I see no reason why this can't go ahead and read from the about:config. Obvious solution is to use user:password@host scheme for proxy host. It uses both offered schemes: url-based authentication and settings-based (network.socks.username and network.socks.password values, not tested yet). Thanks for the patch, Grigory. Our process requires patches to be attached to bugs so they can be reviewed using the integrated Bugzilla tools, so I've gone ahead and done that. I don't think this patch is acceptable while attachment 343493 [details] [diff] [review] is not. @plaintext in a preference: The password is send in plaintext over the network. Secure authentication requires GSSAPI or SOCKS over SSL, which is beyond my knowledge of FF architecture. Moreover, I have never met such servers in real life. Plain username/password authentication usually is the only option. As said by author himself, attachment 343493 [details] [diff] [review] is simply not working: it does not obtains authentication data, it cannot authenticate at all. Besides, it was been written very long time ago, it cannot be applied to current version of FF. Adding SSL/TLS support for SOCKS connections is useless too, no server I know supports it. SOCKS was never meant to be used outside LAN environments. In fairness to the designers of the protocol, it was not clear in March 1996 that the world would adopt SSL over alternatives including GSSAPI, and unfortunately the standard has not been maintained. There was an SSL proposal, but it died before being finalized. A SOCKS 5.1 protocol would probably have a very different emphasis. With respect to these patches though, this is the third time this bug has had a patch storing credentials in a pref, and I don't get the sense that it's going to be accepted where the previous ones have not. Note that the solution to obtaining and/or storing passwords is naturally applicable to cleartext as well as other authentication types (eg. CHAP), and TB's cleartext authentication at least attempts to obfuscate passwords stored locally. The local storage issue isn't going away. This bug is still looking for a contributor with the experience and/or motivation to tie together UI and SOCKS changes, possibly involving a fair bit of refactoring, and the SOCKS changes are the easier portion. As I see in current bug, there was only one patch proposal. And the main problem in that proposal was the fact, that proposed patch was NOT working: that patch only implements SOCKS authentication, but without credentials obtainment. My proposal is a) working, b) obtains credentials from the proxy URL string. I believe, that such implementation is far better than not to support SOCKS authentication at all. I don't think too, that credentials in preferences is good solution, I have implemented that only as a placeholder for future improvements, that part could be simply removed from proposal. But credentials in URL is a common practice. Maybe somewhere in a next decades someone would refactor current architecture, but this bug is annoying for the past decade. And there is a solution to deal with it right here right now. I agree to Grigory, if I save a bookmark in the form http://user:password@domain.com/ it is stored in plaintext too (just tested it). I see absolutely no difference here. Grigory's patch solves a problem that is more fore than 10 years unsolved and has exactly the same security level as bookmarks. If you say that his patch is unsafe because it stores credentials in an URL, then you must disable bookmarking too. I am sure nobody wants that. So please accept Grigory's patch. I really think that any patch for this bug requires UI of some sort. Otherwise, this is way too undiscoverable for any users. Oh come on. It really looks like you are trying to block this feature out. I have seen numerous bug entries where the UI was done later on in a separate bug. The Tor project also needs this feature, but they need to set the username/password *per connection*, using an API. I have independently implemented that, without knowing of the patch here. I'll attach that patch. Given that this bug is currently unassigned, I'll also take it. 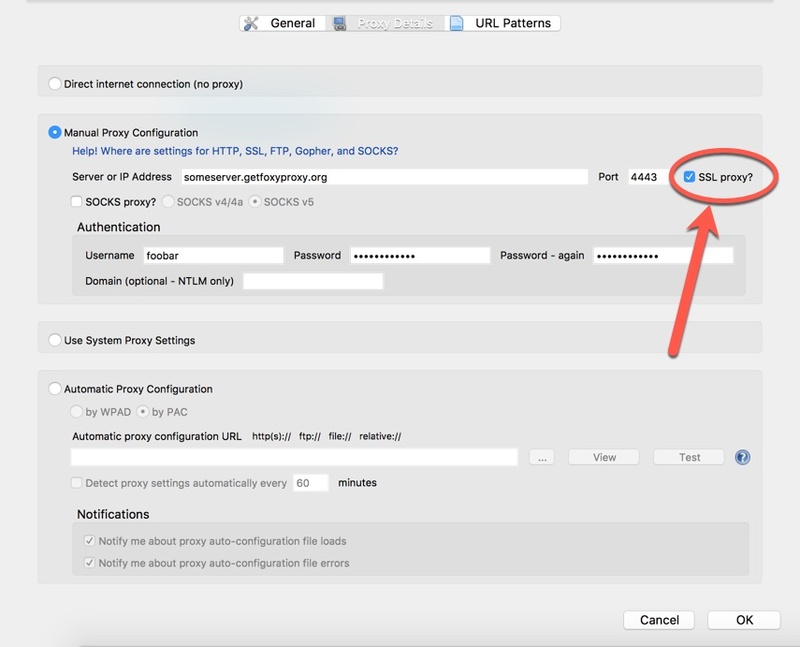 The goal is to allow code that has an nsIChannel for a connection to set the username and password for the proxy. I extend nsIProxyInfo with username and hostname, then let nsISocketProvider.newSocket()/addToSocket() accept nsIProxyInfo instead of individual proxy parameters as they currently do. This allows to pass the username from nsSocketTransport2.cpp to nsISOCKSIOLayer.cpp, which implements SOCKS and can send the username to the proxy. nsHttpChannel implements nsIProxiesChannel, which allows access to the nsIProxyInfo. Luckily, nsISocketTransportService.createTransport() already accepts nsIProxyInfo. createTransport is called directly by the protocol implementations including http. I hope that an "on-modify-request" observer is not too late and the proxy connections is already open. I haven't been able to test that, due to lack of SOCKS servers that actually work and that accept a username. If it's too late, we'll have to find an earlier point that gives us an nsIChannel and the connection isn't open yet. Advise appreciated. For more info, please cross-read the comments in the above Tor bug, before you make a final judgement. The goal for Tor is to separate/silo the requests to different groups of sites, so that the user can't be profiled (which can be dangerous for dissidents). There are also prefs "network.proxy.socks_username" and "network.proxy.socks_password" to set static values for all connections - like the older patches do. Here's a modified and updated version of :BenB's patch. i've only glanced at this.. but honestly this touches a lot of fairly important code in order to tweak a very little used feature. Can you think of any way to make this less invasive to existing code paths? Michal said he'd look at this. Patrick's point in comment 68 is a good one. If we could make this smaller/simpler, that would be great. I don't think that all the logic of passing username and password down to socks IO layer is correct. After reading https://trac.torproject.org/projects/tor/ticket/6733 I still don't understand why is this feature needed. I think this needs to be more explained. Anyway, having a global username and password for socks in preferences is bad. E.g. this won't work when you migrate computer between several networks where the socks is configured via proxy autoconfiguration. We IMO need some auth manager for socks similar to what we have for http webs/proxies. We should keep username/password for every socks proxy. When we don't have user/pass for the given proxy and the proxy requires authentication we need to ask user for it. We should offer both methods and let server to decide which one we must use. Username and password can be 255 characters, so it is not guaranteed that they always fit into mData. Either mData must be resized or preferably Write methods must reallocate the buffer if the data won't fit into the buffer. Sorry I didn't make this clear. The Tor Browser connects to the Tor network by sending its requests through a SOCKS connection to a Tor process. Tor listens for SOCKS connections and creates a separate Tor circuit for each SOCKS username+password combination. We want to enhance the security of the Tor Browser by running streams for each URL-bar domain through a separate circuit in the Tor network. Therefore we need to introduce a method for dynamically associating a SOCKS username+password with each network request. > to ask user for it. The global username+password in preferences is not actually needed for the Tor Browser feature described above. I will remove this part of the patch. > We should offer both methods and let server to decide which one we must use. > methods must reallocate the buffer if the data won't fit into the buffer. Thanks for these helpful points -- I will work on addressing them. On further thought, it seems to me that it's better not to fall back to an unauthenticated connection if we are expecting to supply a username and password. So I would suggest that the client (Firefox) should only offer one method, either authenticated (with u+p) or unauthenticated (without) but not both. 12 years later and this still hasn't seen the light of day, despite patches being available in this bug report. Realistically speaking, what are the chances of seeing it in FF soon? I suppose there is no chances at all. If you really interested in secure proxy — use VPN. SOCKS is unsecure, even a SOCKS5. And this issue - one more nail in the coffin. I'm not interested in a secure/encrypted proxy, I have VPN for that and I'm well aware SOCKS does not encrypt anything. I'm just interested in being able to USE the Socks5a proxy I have which requires authentication! There's a pertinent reason to use it (it's a per application, get's around geo restrictions when I travel without a system wide vpn, etc). It's quite disappointing that after 12 years this is still not implemented in any browser. I'm too very frustrated about this issue. But, extrapolating current progress: that is close to zero chance that this issue will be ever resolved. * use some [policy] routing scheme with VPN. Personally, I use the last one. @Arthur and others who work/worked on patches: would you mind posting your compiled binaries of firefox with your patches applied? Given that you have fairly up-to-date patches, I assume you also have binaries. It would be very much appreciated if you shared them whenever you update your patch -- no website is required, you can just use Dropbox/OneDrive/etc with a public link posted here. @Grigory: I'm pretty frustrated too (it would be inexcusable if it wasn't free). I use a system wide proxy with an application filter, but that fails on DNS requests and has other issues. > Tor Browser feature described above. I will remove this part of the patch. But without some username/password management is this code usable only for the tor browser. And this is not the goal of this bug. The patch IMO cannot be accepted without this functionality. > > We should offer both methods and let server to decide which one we must use. Again, you're trying to address only a specific case needed by the tor browser. Normally, we don't know whether the proxy requires authentication when we use it for the first time. So we must offer both methods and prompt the user for the credentials if needed. So why not push it in nightly, allow for some feedback, then in beta, allow for more user feedback, then in stable, allow for a lot more user feedback, then polish and be done with it ... ? Users will virtually never compile to try and provide feedback, but will gladly try binaries if they are available. I won't work on this anymore. Feel free to adopt my patch, IF you can get it into the tree. Just a comment re GSSAPI. We implemented it in WinGate SOCKS server about 5 years back. Also the OpenText SOCKS client supports it (which we used for testing). So presumably there are other SOCKS servers that support it as well. It's been nearly 14 years now. Please fix/implement this. I wonder what forces are blocking this  primary and easy to implement (I think so) feature? This bug just keeps on giving since I reported it 13 years ago (duplicate). Sometimes it goes dormant for a few months/years, then it strings back to life and makes my day. Thanks for the years of entertainment! Well, Bug 1200802 (https://bugzilla.mozilla.org/show_bug.cgi?id=1200802) is resolved in Firefox 45, released today; so perhaps you won't have to wait 14 years for a fix finally! I just tried Firefox 45. It does not support authentication for SOCKS5 - there is no option to enter username/password, nor does any dialog box pop up to prompt you for the username/password - or am I missing something? Where do you enter the SOCKS5 username/password on FF 45? > up to prompt you for the username/password - or am I missing something? > Where do you enter the SOCKS5 username/password on FF 45? You don't. There's no user interface to enter that information. However, I'll be adding support for this into the FoxyProxy extension soon. OK great - any idea when the next version of FoxyProxy will be out? Making this patch obsolete, as nearly all of it landed in bug 1200802.
you can connect to a proxy via HTTPS by returning the HTTPS method from a pac script. firefox will validate the proxy cert and name. i could also do ssh tunnel to server  with port forwarding, but that's kind of hack same as cert and pac script. users shouldn't self-sign or go through tedious path of obtaining a cert. about:config solution from bug 1200802 seemed like a nice and clean way, but it got butchered. Authentication with SOCKS is now natively supported in the FoxyProxy addon. Be sure you are using FoxyProxy Standard 4.6.1 or FoxyProxy Basic 3.6.1 (or higher). They are submitted to AMO and awaiting approval, so they won't be available possibly for another 24 hours or so. > pac script. firefox will validate the proxy cert and name. If the proxy server's certificate is not valid, you are prompted to accept the certificate into the Fx store. Thank you Eric and all at FoxyProxy. I just installed this plugin last night and all is working great. After 15 years (-10 days) we finally have working Socks5 Authentication in a mainstream browser. > Thank you Eric and all at FoxyProxy. > I just installed this plugin last night and all is working great. > > Thank you Eric and all at FoxyProxy. > > I just installed this plugin last night and all is working great. > WebExtensions system before November 2017, you'll lose this functionality. FoxyProxy just rolled out their new WebExtension version. It does not support Socks5 with authentication. I'm not really sure what I can do to work around this now. Firefox 57 is out, FoxyProxy cannot support authentication with current API in Firefox unless they implement a 3rd party program which operates out of Firefox and acts as a middle man for proxy authentication. It's been 16 years, isn't it time we give this a little bit more importance? Anything would work, a setting in `about:config` maybe, would be easiest to implement I think. Given that most of the patch here landed in bug 1200802, all the hard work is done. All that's needed is something that reads a pref and uses it. My patch here had it (search for mSOCKSProxyUsername in attachment 697715 [details] [diff] [review]), but that part was subsequently removed. It would have to be re-added in a slightly different way, but this shouldn't be hard. Anybody, feel free to step ahead. The only recent version which did support it is 6.0. It does support it as of 6.1 and above. The socks auth code is exposed by the WebExtensions proxyAPI. How is it that firefox (and chrome) is still missing out on this? Considering the general consensus to push for privacy features, this one seems to be the worst of all tasks left in to-do!